Facebook remains among the most popular social media platforms. So, if you aren't using it to promote your blog articles, you could be missing out on a serious boost to your site traffic. Here's what you need to know to get the most out of promoting your blog on Facebook. 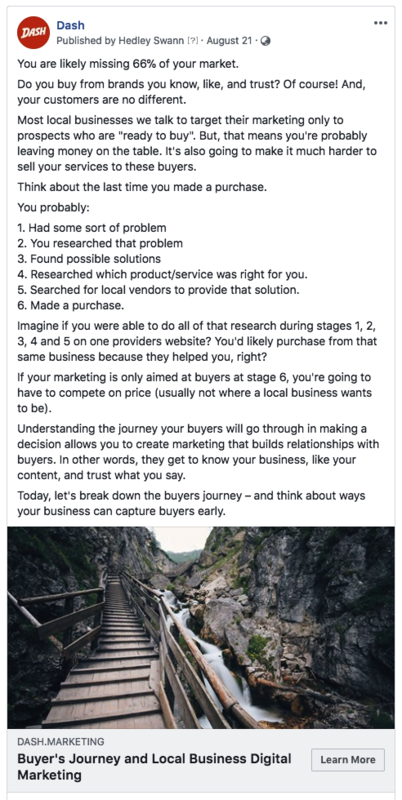 This may seem like common sense, but it is a critical first step for using Facebook as part of your digital marketing strategy. While your audience may be able to find your posts by searching online, putting them right into their news feed will make it even easier to reach them. A brief description to entice the reader to read more. Promoting your blog content on Facebook also increases your chance of people sharing it with others, helping you to find new readers and potential customers. Always be looking for ways to leverage your existing blog content to get the most value from your hard work. You don't always have to use each of these techniques in every Facebook post. 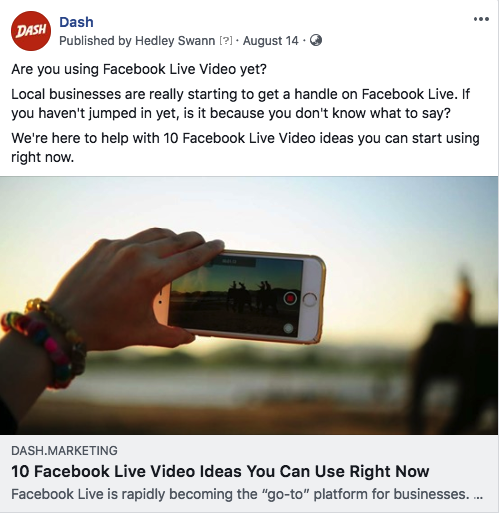 Try choosing a few and craft a compelling Facebook post that gives the viewer a good reason to click-through and visit your blog. You can also experiment with different Facebook post types. The carousel post is especially useful if you want to promote multiple blog posts that share a common theme or idea. Here's an example of a Facebook post we did to promote a blog article. Your Facebook posts don't need to be this long. Try experimenting with different lengths and see what works best for your business and industry. Here's a shorter example. See how it uses questions and common concerns to a) peak the reader's interest, and b) tell the reader what to expect in the blog article? Another technique is to use client quotes or testimonials, highlighting a solution your audience will find in the article so they know clicking over to your post is worth their time. You need to draw your readers in quickly, so give them a teaser of what the post is about without giving away the goods. Rather than just waiting for the likes and comments to trickle, get your post out to an even larger audience. Boost your post on Facebook to ensure that it shows up in your audience's news feeds. You can target various groups, including those who follow your page and their friends, as well as those who have engaged with your page in the past, even if they haven't followed your brand yet. Boosted posts are even more relevant now under Facebook's 2018 algorithm changes that limit the reach of organic brand content from Facebook Pages. When boosting or advertising your blog content on Facebook, take care to choose the right audience for your content. For example, if your company makes affordable nail polish in colours that appeal to teenage girls, you likely won't have much success if you send your ads to middle-aged men. If it's your first time promoting a blog post with paid advertising on Facebook, try starting out by boosting it to "followers, and friends of followers". This will help your post get in front of the people who already follow you on Facebook, and those closest to them. When you publish your post is almost as important as what the post contains. You need to post at the time of day when your audience is most likely to be checking their feeds. If you are a small, local company serving just your neighbourhood, posting in the middle of the night won't attract many readers as most people are asleep. You would be better off posting in the afternoon or evening to reach the right readers. However, if you have a global audience, you may want to switch up your posting times to accommodate your overseas clients. Tip: review your Facebook Insights to see when your Page's audience is most active. This will give you a good idea of where you can start testing your post timings. Also, don't be afraid to post about your blog content more than once. Particularly if you have "ever-green" blog articles, look for opportunities to promote a blog article multiple times. This can be especially powerful if you can re-promote blog content that relates to a timely and relevant issue in the media or your local area. Always be looking for ways to leverage your existing blog content to get the most value from your hard work. Experiment to find what works for your brand. Social media allows you to personalise your brand to engage your audience better. This also means you can tailor your approach to promoting your blog posts on Facebook to suit your business and your audience. Play around with different boosting options, images and post headlines to find the best combination for your organisation. With a bit of time and effort, you'll soon find a formula that helps you grow your audience. ​Driving new traffic to your site week after week with fresh content can be a challenge. You need original, quality content to engage your audience and to boost your SEO. But what happens when you run out of ideas? Here are 10 topics you can use when you hit writer's block.